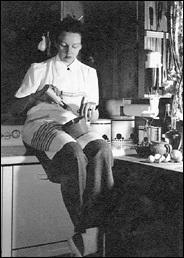 Mary Francis Kennedy Fisher (1908 -1992) was a prominent American food writer who is often considered to be the mother of the genre of food writing. She spent many years abroad and had an eclectic palate. Reading for the first time How to Cook a Wolf, I was surprised at how contemporary her writing seemed with her mention of yoga, the importance of eating brown rice and whole grains, and her enthusiasm for kasha and good olive oil. I wonder what she would have done at Whole Foods. Her style of writing is literary and humourous while at the same time restrained. I always imagined her as some sophisticated woman like Mary McCarthy or Edna St. Vincent Millay experimenting in the kitchen, taking a long bath afterwards, and then sitting down to write with a pack of cigarettes next to her. You don’t have to care about food in order to enjoy her writing.